A wrinkle filler used to plump the skin. RADIESSE is injected through a small needle and placed under the skin. Immediately, this filler works to add volume under the skin and over time, the benefits of RADIESSE continue by stimulating your body’s own natural collagen. Also restores a more youthful appearance to your hands. Radiesse® works with your body, below the skin’s surface. Tiny calcium based microspheres form a “scaffold” to support and stimulate the growth of your own collagen. Over time, the calcium based microspheres gradually break down and are safely and naturally absorbed by your body. 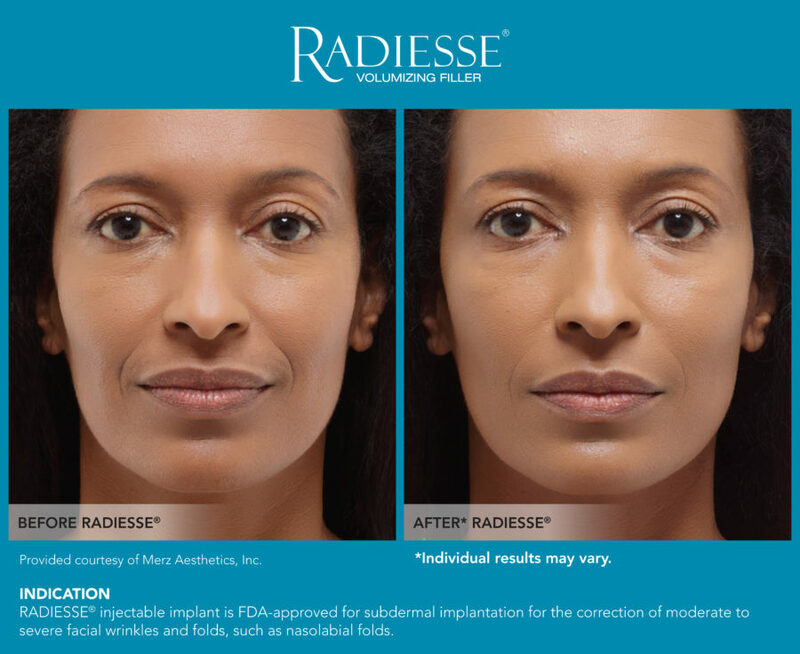 Radiesse® does more than just temporarily fill in facial folds and wrinkles – it can restore facial volume for the youthful look you want. How Soon Will I See Results? How Long Will They Last? The results are immediate. Radiesse® may last a year or more in many patients. Since results may vary, be sure to discuss your expectations with your doctor.